TOKYO, Feb, 05 2019 - (JCN Newswire) - NEC Corporation (TSE: 6701) has contributed to a high-definition video transmission test utilizing 5G to a high-speed train conducted by NTT Communications Corporation, NTT DOCOMO, INC. and TOBU RAILWAY CO., LTD. through the provision of a 5G base station(1). 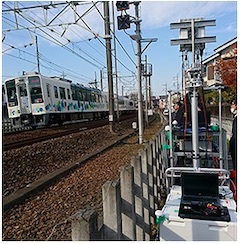 This test was conducted in Kasukabe City, Saitama, Japan, using a train on the Tobu Skytree Line from December 17 to 21, 2018. 4K and 8K high-definition videos were transmitted from a 5G base station installed along the railroad, corresponding to the 4.5 GHz band and 28 GHz band, to a 5G mobile station located inside a train running at approximately 90 km/h and projected on a large display in real time. In addition, the videos were transmitted to 40 smartphones on the train via wireless LAN. The NEC 5G base station was equipped with a Massive MIMO antenna, which forms beams (directivity) that concentrate power on the location and direction of the 5G mobile station. 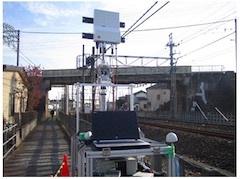 Since the antenna always forms optimal beams for a mobile station by making the beams track the mobile station in motion, it is capable of realizing a high-data transmission rate and high-quality wireless data communication, even for a mobile station installed inside a moving train, as in this demonstration. This demonstration of 5G enables the transmission of high-presence and high-definition video content, even on a train or a bus in motion, providing a service that allows the distribution of large-capacity content in a variety of media, regardless of the location or situation. Moving forward, NEC will continue to work on 5G verification throughout a wide range of use cases, such as urban and rural areas. This demonstration includes part of the results of a 5G Integrated Verification Trial conducted by NTT Communications Corporation in 2018, "The commissioned research and examination concerning technical conditions, etc. for the fifth-generation mobile communications system capable of high-speed communication exceeding 1 Gbps on average during moving at high-speed," commissioned by Japan's Ministry of Internal Affairs and Communications. (1) The 5G base station and the mobile station equipped with the Massive MIMO antenna that support the 4.5GHz band feature enhancements based on results from "The research and development project for realization of the fifth-generation mobile communications system" commissioned by the Ministry of Internal Affairs and Communications, Japan.